From high Himalayan peaks to the plains of the Indian subcontinent through the jungle of Chitwan National Park, a summary of our kingdom is offered to the bikers. Glaciers, Alpine meadows, forests, lands of the Buddha will also be at the rendez-vous of this fabulous adventure. Arrival in Kathmandu and transfer to the hotel. Briefing in the evening. After breakfast, visit of the medieval city of Bhaktapur and lunch on site. We will drive to Surya Binayak and Lubhu, a town known for its handmade cloth. The visit of the temple of Vajra Varahi will follow, before going to the hotel in Godavari. Free day. If Kathmandu and its valley are the architectural treasures of Nepal, Pokhara is its natural equivalent with its immense variety of semi-tropical plants and warm climate. The city is perfect for relaxing and enjoying the good weather thanks to a wide choice of shops, restaurants and bars on the shores of the lake. For the more energetic, it is also one of the most famous spots in the world for paragliding, boat trips or a simple hike to Sarankot for example. Altitude: 850m. 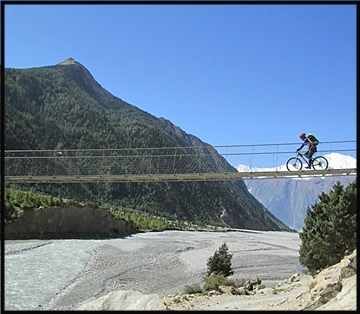 Hike and bike for that day where we will borrow part of the Royal Trek, so named after Prince Charles made the tour. If time permits, it is possible to visit a Tibetan refugee camp before arrival in Pokhara. Altitude: 850 m. Hike: 8 km. Bike: 10 km. Flight to Kathmandu, one of the most spectacular aerial experiences. During this 30-minute flight, we will approach the highest peaks closely of the world. Free day in Kathmandu. Flight duration: 25-30 min.